If the cottage is available, a 30% deposit ensures reservation, which will then be confirmed in writing. Payment can be in UK Pounds, Euros, US Dollars or other major currency. Cheques should be made out to "Mark's Place Ltd.". Alternatively ask for bank account details for direct transfer. The remaining 70% plus £200 damage deposit is due six weeks before departure. You will then be sent the keys. The deposit will be returned, less any damages, on return of the keys. Quoted rates include cleaning costs and laundry (unless more than the reccomended number of people staying, see below). This is unusual in Europe where many self-catering establishments charge substantial extra amounts for these items. Normal availability during high and peak seasons is Friday to Friday, but bookings may be flexible. Shorter stay rates are available during low and medium seasons. These are shown per week for the cottage (not per person), inclusive of all taxes, cleaning at beginning of stay and change of bedding and towels. If you do exceed the recommended 8 people staying there is a £30 charge to cover extra cleaning and laundry. 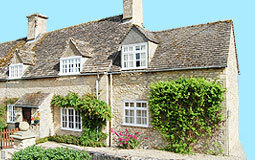 Even at dear times be sure to compare our Cottage with other accommodation on a "per head" basis! New Year 2015/16 Only New year left. 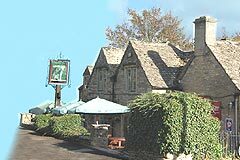 Any stay including New Year's Night minimum £750. Both May and Whitsun Bank Holiday weekends already booked. Daily (nightly) rates: Minimum charge per stay is £450, except for bank holidays or special weeks such as Cheltenham, when the minimum charge per stay is £525. Workdays are Monday-Thursday (not bank holiday). 1st Sept to 23rd May there is a heating supplement of £15 per stay. High season weeks get booked well in advance, so it is best to book early!